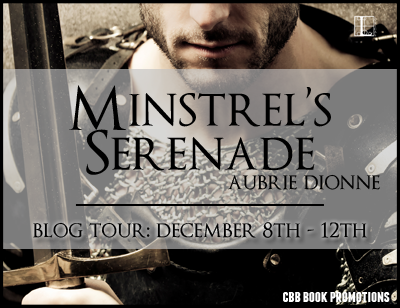 It's been a looong time since I've read epic fantasy so when the virtual book tour for MINSTREL'S SERENADE by Aubrie Dionne landed on my email I just have to sign up. Part of me was excited while another part of me was wary because of the length. I mean an epic fantasy that's under 300 pages? It's gotta be a prequel right? 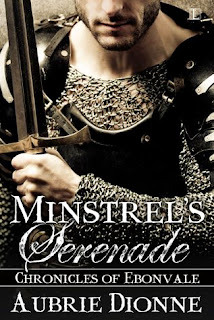 Well MINSTREL'S SERENADE isn't a prequel but the first novel of Chronicles of Ebonvale. I wasn't blown away by the story, it has great bones with princesses, knights, and a war against an army of fire breathing wyverns. Kingdoms and peoples from all over the land are rallying against the onslaught and the fate of humankind lies on Princess Danika. The novel has that medieval and conquest feel to it, the world building isn't as complicated as other epic fantasies but still managed to hold its own despite its simplicity. The cast of characters isn't too long either so it was fairly easy to remember who's who and what and acclimate to the world ADionne created and get into the story. The word index isn't that complicated too, no unusual nouns and words plus the story was more character driven than plot making it a quick and easy read. Given all those good points I still didn't find MINSTREL'S SERENADE as epic as I hoped it would be. Inasmuch as it has a sound foundation for epicness, it didn't give me that 360 degree view we often find in epic fantasies. I didn't get a good feel of the land and the turmoil its in and aside from Dannika, I'm barely acquainted with the rest of the key players in this story. Speaking of which, a POV from the Queen of wyverns would've been good since they're part of the cast. I sure would like to know if there are other motives behind their impending attack besides the usual siege and conquer. Lastly as this is called MINSTREL'S SERENADE I was expecting a big myth behind the minstrels and why they're so special. Let's just say they're more Pied Piper than demi godlike to me at this point. I liked where MINSTREL'S SERENADE ended though and I sure would like to know how the battle is going to go down. There's also a bit of a romance, it's a clean one btw, and it's the kind that's "frowned" upon because the Princess is in love with a man below her class. But war make heroes out of ordinary folk so who knows, maybe on the second book said lad would be more than worthy to take Dannika's hand. So happy you tried this and liked it! I didn't get my fill of epic fantasy but the fact that it's short and light made up for it. I don't think I'd read it anyways if it's over 500 pages. So true, I don't think I would sign up if the book is super long. Don't have the time for that right now. I really love that cover. even though I don't think the book is for me. I just don't know on this one. I keep seeing it around and I am curious but I read another book by this author and it was just okay. I've had some luck with fantasy lite titles in the past, so I don't think this not being high on the epic scale would put me off from trying it. Cool cover! Yeah, I'm with Sophia...her sci-fi is pretty good. With fantasy, you want to get lost in the world..the characters, to get swept away with all of it. Doesn't seem like it happened here...at least not so much. This is my first Aubrie book, what series are you two talking about? I'm happy you're reading multiple genres Braine. I'm stuck in the PNR and UF right now. Wow, I love the epic fantasy described here with wyverns and everything, but I guess it seemed like it didn't provide extensive world building as usual with the genre. Really great review Braine, thanks for your thoughts. Hmmm, so maybe the length was an issue. If you didn't get everything you wanted, then I don't know if I would either. Epic fantasy has to be pretty amazing for me to read it. Oh epic fantasy, I don't read a lot of them, it's like erotica. It's not that I hate it but I'm never that attracted so I read the books when publisher sends but otherwise it's true that I don't really go toward them. I'm still finding my way around the genre but it's worth exploring that's for sure. I've only tried a few but I'd like to get to know some more authors. Maybe so, I hold off judgment til I read the second one, if the sequel fails then that's when I call it quits! Bummer that you didn't find this to be as epic! Great review.